Amazon.com Inc. (NasdaqGS:AMZN) became the world’s second trillion-dollar company on September 4, 2018, when shares pushed through the $2,050.27 needed to make it happen. But, I think it’ll be the world’s first $2 trillion player. Unbelievably, many investors still think of Amazon as a “shopping” company. I get it – my family and I seem to singlehandedly support the company’s shopping revenues. And, like many people, I’m saying that only halfway in jest! But Team Bezos is much more than that, and the fact that most investors can’t see beyond the packing tape is a huge opportunity for you to jump in… before the markets recognize the profit potential we’re about to discuss. Many analysts believe that single biggest driver will be Amazon Web Services (AWS), but I believe the real value creator is artificial intelligence (AI) led by – you guessed it – Alexa. If you’re not yet familiar with Alexa, you will be. Amazon’s Alexa is a digital personal assistant of sorts that resides within the Amazon Echo and Echo Dot smart speakers, developed in Amazon’s Lab126. You can ask Alexa questions, ask “her” to dim your lights, or stream music. Shortly, there will be a whole lot more as the number of connected devices grows. And it WILL grow! 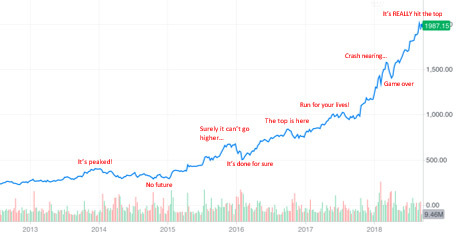 Voice-driven technology is going to be an $18 billion market in under five years, according to Markets and Markets, but I think that is far too conservative. $30 billion is probably far more likely. That’s because Alexa learns from everything it hears. I know it’s not supposed to be listening to everything you say but… puuuullllllleeeeease. Alexa is learning even if you don’t talk to it… about your habits, about your home, about your speech patterns, about connected devices. And that information, in turn, is rapidly being spread to other parts of the company, not the least of which are Amazon Go stores, Prime, and, of course, AWS. In fact, the related patent filed in June 2017 tells you this is coming. I think there’s a good case to be made that Amazon’s entire AI effort is being driven by the idea that they’re going to use what they learn to immediately hook you into spending by subtly capturing and – if need be – altering your behavior. This seems far-fetched, but I’ve already had it happen to me. My wife and I were talking about attending the Monaco F1 races… in Japanese from our home in Washington. Less than five minutes later, we had an advertisement served up in Japanese for French travel with sub advertising related to F1!! This is the segment that allows Amazon to dominate every other business segment it enters because of the related cash flow it kicks off. People don’t realize this, but AWS launched just more than a decade ago and now enjoys roughly 34% market share of the cloud infrastructure market, according to Synergy Research Group. That means it is bigger and controls more traffic than the next four competitors combined. Most analysts brush this off, but that’s a very expensive mistake. Team Bezos will generate something on the order of $25 billion within the next 12 months from cloud-related businesses. That’s a trajectory of nearly 50% growth, accounting for 65% of total operating income. Anything – any business segment or company – with a big, fat margin is a suitable target. Many investors have made the mistake of assuming that’d be limited to retail but, in reality, every industry is potentially subject to an Amazon assault. I expect Amazon to move into the following big four industries within a year: finance, healthcare, pharmacy, and even services. I can easily envision, for example, Amazon opening its own drug stores and selling sponsored “medical” supplies from related companies, dealing in everything from medical records to treatment. Financially speaking, there’s no question in my mind that Amazon will tap into personal banking, credit, and even consumer loans. There are few regulatory hurdles to be worked out, but that’s merely going to be a distraction. Amazon is just getting rolling in this department with sponsored advertising that will put it in direct competition with Alphabet Inc. (NasdaqGS:GOOGL), Apple Inc. (NasdaqGS:AAPL), and even Netflix Inc. (NasdaqGS:NFLX) offerings. Most people are still in the “shopping” mindset when it comes to Amazon, and don’t think this will happen because they envision a product-driven play, but I think they’re missing the point. Amazon doesn’t need a traditional product to be successful. The easiest way to play along is to buy shares of Amazon itself. Whether that’s directly or through a fund really doesn’t matter. That you are on board is the point. At this point, buying 100 shares will set you back a cool $200,000, as I write, and well beyond the reach of most investors. So consider a fund-based alternative instead. My favorite one of ten very specialized “26(f) programs,” the T. Rowe Price Blue Chip Growth Fund (Nasdaq:TRBCX), I recommended nearly two years ago when I debuted a special report on December 14, 2016. Amazon’s a key holding, and shares of the fund will set you back only $112.64 as of the moment I’m typing. Just click here to learn more about nine other “26(f) programs,” and find out how you can get access to the other nine that make some of the most highly priced companies in the world look cheap. However, that’s only part of the picture. In as much as the Amazon “effect” will set you up for fabulous profits ahead, there is a dark side. The moment Amazon announces its first health clinic, hospital stocks are going to tank. The instant Amazon debuts a personal financial vendor, bank stocks take a hit. I can’t even begin to describe the damage to insurance companies when the jointly developed health care initiative announced by Team Bezos (along with JPMorgan & Chase Co. (NYSE:JPM) and Berkshire Hathaway Inc. (NYSE:BRK.A)) opens for business. Amazon has the vertical supply chain, a track record of eliminating the middleman, and, importantly, the buying power to stop the existing health care cabal in its tracks. Speaking of which, I hear a never-ending chorus of skeptics out there when it comes to Amazon. The only thing those folks have gotten right for the past 21 years is their underestimation of the company’s potential. $2 trillion isn’t that far away. Editor’s Note: For the first time ever, our Executive Publisher, Mike Ward, has invited all 2.6 million Money Morning subscribers to tune in for this urgent marijuana briefing. This could be your ticket to $2 million in the next year. Click here to RSVP now. Mr Keith aren’t you worried that Alexa was listening in on the conversation between you and your wife? You’re not bothered about invasion of privacy? And won’t Amazon be a victim of it’s own monumental success if it’s plan to permeate every industry causes the justice department to come calling because of anti-trust issues?